Cohasset voters next month will decide whether this affluent town of 7,500 will become the second community in the state to restrict the use of leaf blowers. The proposal, submitted for Cohasset Town Meeting through a citizens petition, was penned by Marcus Ramsden, who lives on Jerusalem Road and calls leaf blowers "the screaming babies of landscaping equipment." The 43-year-old outdoor enthusiast, who enjoys his frequent outings along the town's craggy shoreline, says that Cohasset, which has preserved 30 percent of its landscape as open space, should show equal zeal in preserving the town's "soundscape." "Gone are the days when the sullen teenager, raking next door, doesn't impact me with noise beyond the tines scraping the driveway," Ramsden said. "When I can hear you operating a leaf blower a quarter-mile away, that does impact me. Isn't it sad when you pray for a rainy day as a respite from the noise?" Ramsden's proposal calls for banning the use of all gas-powered leaf blowers on Sundays and Mondays. Leaving Saturday open allows homeowners a chance to clean up their yards, he said. Less noisy electric blowers would not be restricted. 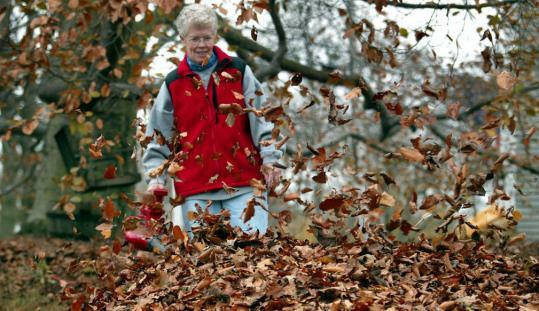 All leaf blowers would be allowed to operate from 9 a.m. to 5 p.m. Tuesday through Saturday. Ramsden said the bylaw would become effective in January 2009. "That gives people time to get used to it," he said. While restrictions on leaf blowers may be new to Massachusetts communities, they have become com mon in other states, such as California and Florida. Ramsden notes there is some precedent for restricting noise in Cohasset, because it is a "whistle-free zone" on the Greenbush train line. To date, Ramsden has presented his proposal to the selectmen, the Sustainable Cohasset Committee, and the Advisory Committee, with mixed results. Selectmen voted unanimously to recommend against the proposed bylaw when it is presented at the March 29 Town Meeting, mostly based on their concern over its impact on local landscaping businesses. The Advisory Committee last week also recommended against passage. But members of Sustainable Cohasset are enthusiastically in favor. "While this is about noise, we're the green group in town and we talked a lot about the side benefit to this of having carbon emissions lessened," said committee member JoAnn Mirise. "Anything our group can do to support this, we'll do." Mirise added that Ramsden's noise concern is shared by others. "Because of the affluence of this community, a lot of people hire landscape companies," she said, "and it's definitely a big bummer when the summer comes and they start up their leaf blowers at 7 a.m."
But members of the Advisory Committee were not convinced when they took the issue up last week. "Do you need a separate bylaw for this, or is this something that could be covered in existing bylaws on nuisance and noise?" asked committee member Patrick Waters. Ramsden argued the town would then have to get into measurement of decibel levels, which can be tricky and result in litigation against the town if disputed. Advisory Committee member Chartis Tebbetts noted that bylaws created to curb specific sources of noise have precedent in Cohasset. "In Little Harbor, when the noise of jet skis intruded on people, the result was they could operate every other day," Tebbetts said. "I think leaf blowers are the most useless and bothersome things going," she added, but enacting a bylaw could open the door to complaints about noise generated by other machines such as lawn mowers, chain saws or snow blowers. "The issue is consideration of your neighbors," she said, suggesting public education might work as well as a bylaw. Chairman Sam Wakeman said the committee "felt it was too specific to leaf blowers, and the total noise generation issue should really be looked at." The proposal for Cohasset is not nearly as stringent as the comprehensive ordinance set to go into effect in Cambridge next month. That city's regulation prohibits the use of all leaf blowers, both residential and commercial, for five months a year - from Jan. 1 to March 14, and June 16 to Sept. 14 - and all Sundays and most holidays. The blowers can operate only during the outdoor cleanup months in the spring and fall, and then only for limited hours. Meanwhile, officials in Newton are working on their own regulations, which, if approved, would go into effect in January 2009. The proposal under consideration would ban the use of gas-fueled leaf blowers, both residential and commercial, from April 15 to Oct. 15. A series of fines would be levied against violators. Ramsden has also included a fine of $200 in his proposal. "You could call it a fine or people could see it as paying a fee to use the collective soundscape to your own ends," he said. Ramsden's neighbor Frank White, who owns an organic farm on Jerusalem Road, signed the citizens petition for the leaf blower restrictions. "I believe in grinding up the leaves and putting them back onto the ground," White said. "There's a certain liberal element in town, but this is a town that voted for Governor Romney," White added. "This is a little bit like tilting at windmills. I don't think it's going to get very far." Christine Legere can be reached at christinelegere@yahoo.com.